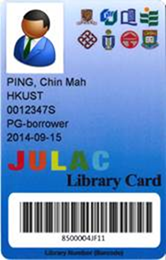 JULAC Library Card allows card holders to have access to other UGC-funded libraries. All faculty, academic equivalent staff, research assistants and postgraduate students are eligible for JULAC cards. The card lets you use the facilities of and borrow materials from other libraries. Application is free. Undergraduate students are eligible for JULAC reader cards only. The card lets you access other libraries without borrowing privileges and expires on July 31 each year. Each host library will charge you HK$50 for registration and renewal. You can apply online for a JULAC card or in person at the Circulation Counter. You can submit your digital photo in the online form. Alternatively, the Library can provide the photo-taking service for you. Some libraries may have blackout periods during which access by JULAC card holders is restricted. Most often, it is during examination weeks. Check the websites of individual libraries for details.